We had to complete a project work on a suitable topic of our choice on computing subject in the first semester. 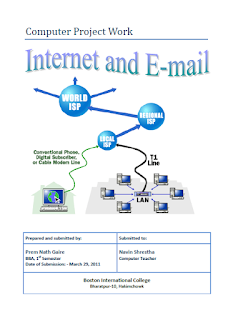 I chose the easiest topic 'Internet and Email'. Although it isn't any special work, I did some extra job to make it better. Therefore, I am sharing it with you in this post. If you are a BBA student just studying first semester from Pokhara University, then you would appreciate to view a sample project work on computing. That's the exact reason why I am sharing this with you here in my blog. My purpose is to make this blog resourceful for the BBA students and one of the ways of doing this is to share my works with you. Another reason that my work would be useful to you is for getting acquainted on the subject. Since 'Email and Internet' is one of the chapters of the computing syllabus, my project work can serve you as notes on this specific topic. I have some uniqueness in my work, especially on using footer notes and using screenshot, in comparison to the work of my friends and probably others as well. Comparing with the work of friends isn't unreasonable because comparison is done among the people with similar abilities, skills, or age. Since, I share a lot of things in common with my friends, in terms of skills, ability, and background, I see it reasonable for me to compare myself with my friends. However, my friends would disagree that I have similar skills as them, but, I hereby, assure you that I am an ordinary guy and that I fare better than my friends only because I work harder and push myself beyond my own limits. (You can read about my secrets of excellence here.) This project work is also the outcome of many revisions and rigorous edits. So, let's be back to how I have made my work unique among friends. First, I have used footer notes to cite the sources of the information I have included in my work. This isn't much important at this level but it is a good practice to use them. You will have to use them compulsorily in the project works and research works you will be doing later, especially after the fourth semester. Second unique work of mine is the screenshot of a browser along with labeling. I guess this was some extra effort from me. By mentioning this, I actually want to inspire you to put some extra effort in your work and make it unique and better from the others' work. A little bit more effort can also make your work so much better, especially when it comes to adding images and other media in your project works. Now, with all this background information, I am providing the link to the pdf file of my project work. You can view as well as download it here. I hope you'll enjoy viewing and reading my project work. However, if you have any critiques or comments then you can leave them on the comment box below. Disclaimer: Please do not use this project work for your own assignment. This only reduces your creativity and harms yourself more than it does to me or anyone else. If you think it worthless to invest your time in doing your project work then make it worthy, as I do. For example, I am publishing it on my blog to make it more valuable. You can also share your work or introduce more purposes to your work. However, never take a shortcut because there's no shortcut way to success, if your aim is to achieve one. Also I would like to request you not to download this work just to publish it on your own site or blog. Provide a link to this article instead so that your audience can view or download it from here. That way, you will not be breaching the copyright laws and instead you will be being thankful to me. Actually I couldn't get what you mean. I am assuming that you want to say it is helpful for your career. Indeed my purpose is to encourage you as well as help you to achieve better results in every work you do. So, thank you anyway for your comment.